Simmer in a large 3-4 quart pot of water with 2 tsp. salt; simmer until potatoes are soft about 15-20 minutes. When cooked, drain water and return sweet potatoes to pot and place on burner over low heat. Add butter or oil to pot and stir until melted. Add coconut milk, salt, pepper, and spices. Using a potato masher, mash the sweet potatoes or puree in a food processor. 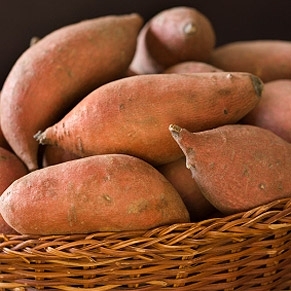 Health Benefits of Sweet Potato: Sweet potatoes are full of beta-carotene, the pre-cursor to vitamin A. Eating sweet potatoes with some healthy fat can aid in absorption of nutrients.